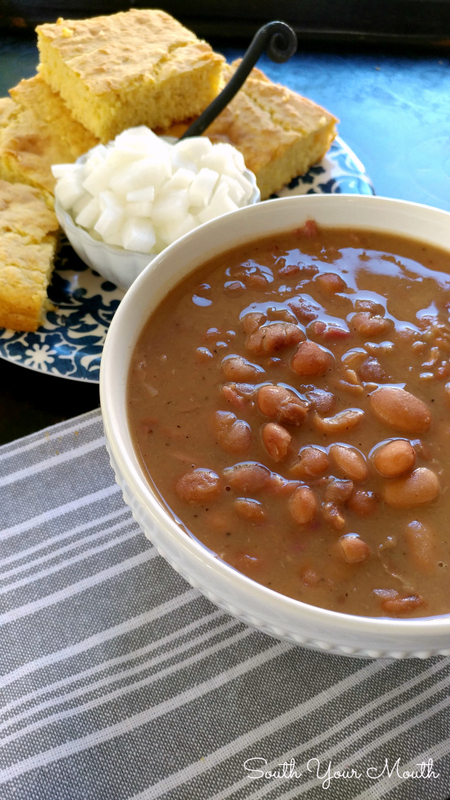 Dried pintos beans cook up creamy and tender with a smoky, silky sauce that's perfect with cornbread. Recipe includes instructions for crock pot and stove top preparation. I love me some pinto beans. 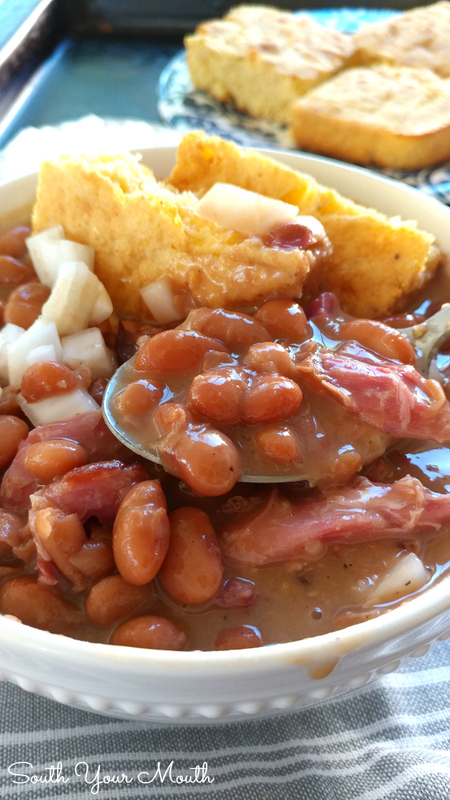 Throw some fatback or ham hocks in the pot, cook them low and slow then eat them up with some skillet cornbread and diced onion and I’m in heaven! I’ve eaten many a good pot of beans growing up here in South Carolina but I’ve got to tell ya… the best pinto beans I’ve had have come from Texas. And the places in Texas I’ve had them (usually within a hundred miles of the Dallas area) are pretty serious about their pinto beans. I’ve always enjoyed some fresh diced onion with my pintos but I never expect them in a restaurant. That is, until I had them in Texas. Most places will serve them with a little bowl of diced onion. And a few places will give you some chowchow or other pickle relish to eat with them too. Man, DANG! That's alllll riggghhht. I knew I wanted to make pinto beans this weekend so I thought I’d ask on the Facebook page for any tips my Texan friends might be able to give me on how to get those perfectly creamy, saucy, tender beans. All of the major concepts were in line with how I already cook pintos (or any dried bean) so I played close attention to the little details people were giving me and decided to try those out. 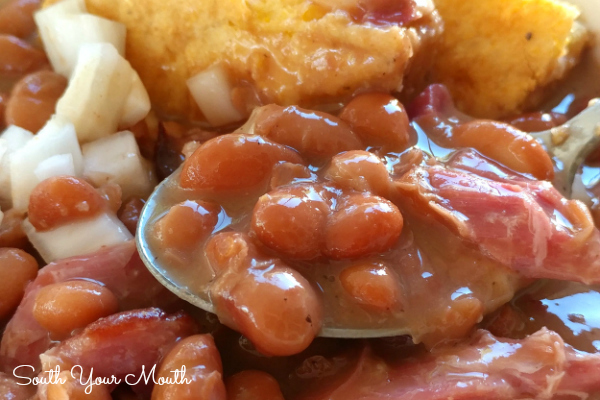 When I was done, I’m proud to say, I’d cooked the best batch of pinto beans I’d ever made! One thing I had working in my favor was my bag of Hurst’s dried pinto beans because they come with a little miracle packet of smoky seasoning that just takes the flavor over the top. I also managed to score some of the most beautiful ham hocks I’ve seen in forever so my beans had plenty of ham bits and layers of flavor too! I didn’t (and rarely do) soak my beans overnight. I just threw everything in the crock pot and waited until they were mostly cooked before I seasoned them to keep the beans from getting tough (salt can make certain types of dried beans tough if you add it too soon). I also ladled out a few cups of beans and broth which I smashed into a silky smooth gravy with the back of a fork then added it back to the beans to make sure the sauce was thick and creamy. If you can’t find Hurst’s Pinto Beans with Ham Flavor in your local grocery store, ask for them! My grocery store now carries all sorts of products they didn’t have before simply because I asked for them. 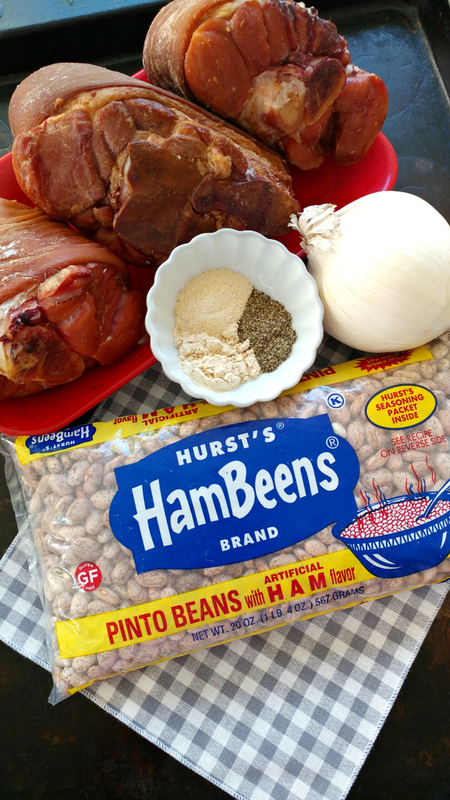 Cajun Ham & Beans - A recipe for smokey, creamy beans cooked low and slow with a ham bone and Cajun seasonings. DELICIOUS over rice! Add beans WITHOUT seasoning packet, chicken broth and water to a slow cooker then stir to combine. Add ham hocks and onion pieces to cooker, cover and cook on high for 4 hours. Set seasoning packet aside. Add seasoning packet and remaining spices to cooker, stir to combine, then cover and continue cooking for 2-4 hours or until beans are very tender. Remove ham hocks to cool. Remove onion pieces then discard if desired. Ladle out 2-3 cups of beans and broth then mash until smooth either with the back of a fork, a potato masher or whatever else gets ‘er done. Add mashed beans back to cooker and stir well. Turn off cooker and let beans rest, uncovered, for one hour. Don’t worry, they will still be plenty hot when it’s time to eat. Doing this just allows the broth to thicken up and things to get extra creamy. Meanwhile, remove meat from ham hocks, shred or cut into small pieces then stir into beans. If you can’t find the Hurst’s Pinto Beans order them online or substitute with 2 cups dried pinto beans then use 1 ½ teaspoons salt plus 1 teaspoon liquid smoke in place of the seasoning packet. You can also use smoked turkey legs or wings or 1/2 pound fatback, side meat or salt pork (rinsed) in place of the ham hocks. You can certainly cook these on the stove too. Simmer for 2 hours instead of cooking on high in the crock pot for 4 hours then follow the recipe. This makes me want to run home and put some beans in the crock pot! I love it just the way you prepared them. Optionally, hold out about 1/4 of the beans from when beginning to cook. Add in after 30 minutes. These beans will be less done than the rest, and will give a bite to the finished beans. Try Fiesta brand pinto bean seasoning. Geez girl! Where did you find those gorgeous ham hocks? The only ones I've seen in the stores lately were all skin and bone! Wow, and me too, re smoked hocks--not meaty *at all*! Nice flavor, but I always feel like I need to add more ham bits in. All I can figure is that we much have some mighty skinny pigs around these parts! By the way, if you've joined the Instant Pot enthusiasts, pintos are *wonderful* in the Pot. No soaking, way less cooking time, super-tender and creamy. I do mine in two stages--enough to get the beans tender, then a second, shorter burst to go the rest of the way to creamy. The only change I would make with this recipe is to remove the hocks right after the first stage and hold off the onion chunks and all spices until that second round (pressure tends to fade seasonings and turn veggies to mush). Pick the meat from the hocks while the second round is going and add at the end. Dang, this looks wonderful! I made these according to the recipe but used a leftover ham bone instead of the ham hocks and OMG...can you say DELICIOSO?!!!! The BEST pintos I have ever eaten in my life! My hubby took the leftovers to work the next day so his coworkers (all guys) could "defend themselves" (if ya know what I mean, LOL!!!) They all requested a "remake"! 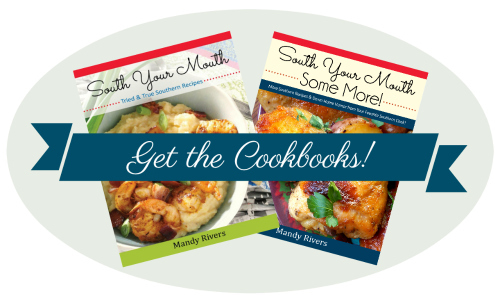 These were divine and the crockpot did all the work! Beans and cornbread are probably my favorite meal. Where I live has been so urbanized, it's true, I can't get a good ham hock. I stock up when I travel to nearby West Virginia, or when I'm in the Carolina's (I have a sweet spot that I go to that never fails me). I've never tried this brand of beans, but I'll look for them. Thanks for reaching out to your FB family for tips, I'm always on the look out for those as well. I live alone, but I swear, a big pot of beans and an iron skillet of cornbread, whether it winter or summer, taste's just right all week long. Thanks! I don't have a ham hock or ham bone. But I do have bacon! Would that work and how would YOU do it with bacon? The last time I made pintos in the crock pot, they didn't get soft..even though they were well cooked. Any ideas about why? I like my beans to almost melt in my mouth. You've posted so many recipes I really like! Thanks so much! Thank you! The only thing I can think of is salt. Sometimes salt can make the beans tough if you salt them in the beginning of the cooking or during soaking. I let mine cook at least 4 hours before adding any sort of salt or salty seasoning. A must for adding a lil bite to your soup beans.....Slap ya mama! Or if the beans are Old.. that will stop them from softening uo also. And yes.. Never salt your beans at the beginning.. it will also toughen them.. I've got my stuff and its definitely on my menu tomorrow! Can't wait to try it out!.. I maded these tonight and man they were so good and tender.. I didn't have the seasoning pack from the package.. So I did the salt and liquid smoke.. it was so yummy.. Will make again.. I love fried potatoes with my pinto beans and cornbread. Only way to go. What size slow cooker did you use for this recipe? 1) Boil the ham hocks in water, cool enough to remove meat, add back to pot and heat to boil again. Put the stock in frig overnight and skim fat off the top next morning and toss. Proceed with recipe. 2) I add less meat and more spices for flavoring. 3) I eat the beans over riced cauliflower instead of rice. The first time ever I did this I said nothing to my cauliflower-hating son and husband. They had NO idea it was not rice and we eat a lot of cauliflower now. Thanks for sharing your recipe - it was delicious! 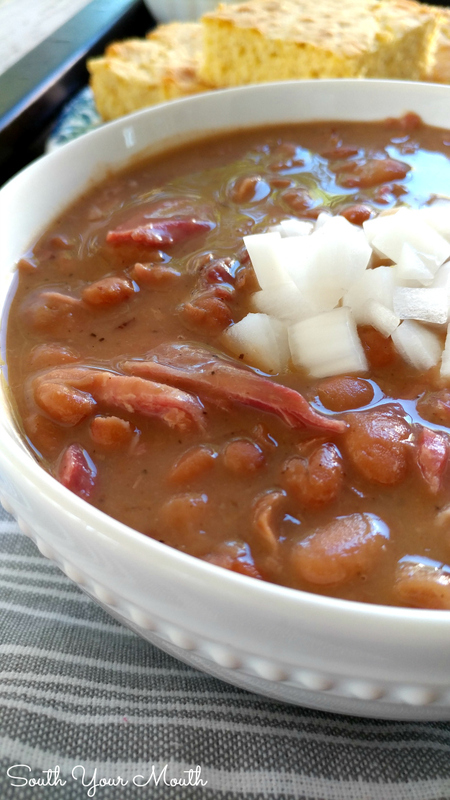 Do you soak your beans overnight before you put them in the crockpot? No, I just cook them all the way through in the crock pot. OH MYYY! 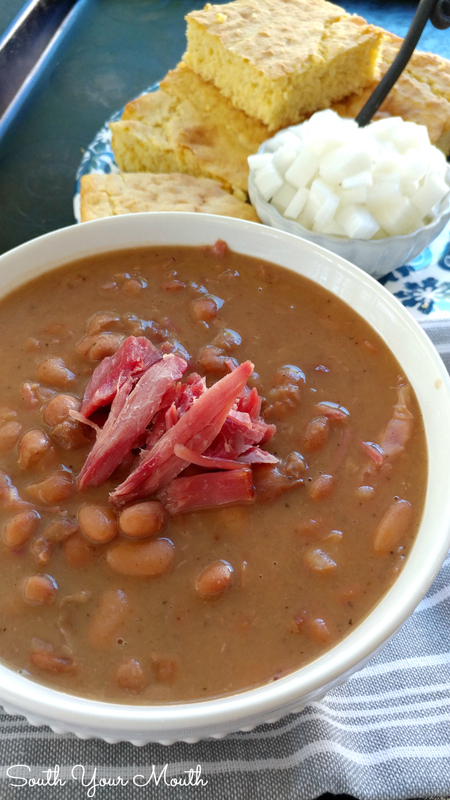 !I'm not a southern girl, never had pinto beans and ham before but I was tired of using my ham bone for pea soup and this looked so wonderful. WELL it was just fabulous! The seasoning was perfect,( I used the salt and liquid smoke), and the beans were creamy and delicious and my ham was melt in your mouth! I served it with the onions and made some Jiffy muffin mix with drained Rotel tomatoes and some smoky bacon cheddar on top. My picky husband licked the bowl! I like to make what we call Mexican cornbread. I make my regular recipe but instead of milk I add a can of cream corn and a can of diced chillis. Add a bit of garlic and onion powder and a bit of chilli powder.Then fold in a cup of shredded cheddar cheese. Bake till golden. Now that is some good stuff right there. I'm so glad you enjoyed them!! I will be making this recipe on the stovetop. How long do I cook the beans after adding the seasoning packet? Maybe the best beans I've even eaten! I don't have a slow cooker large enough for this recipe so I made them on the stove. I followed the recipe as written and cooked them for about for 2 1/2 hours. I always soak my beans overnight. Great recipe, thanks for posting! Excellent! My hubby dislikes pintos usually. He loved these!